This Bruce Hickory Rustic Natural features micro-beveled edges and ends a janka wood hardness rating/resistance to denting of 1820. The flooring is 1 piece milled from lumber and can be sanded and refinished if needed. Due to the sensitivity of solid wood to moisture and extreme temperature changes, this flooring cannot be installed below grade. The flooring has a pre-finished hickory rustic natural medium color with a low-gloss finish. 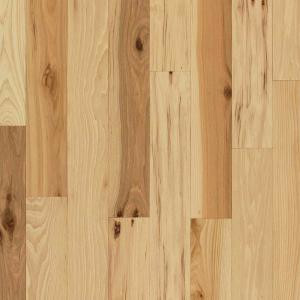 Buy online Bruce Take Home Sample - Hickory Rustic Natural Solid Hardwood Flooring - 5 in. x 7 in. BR-595887, leave review and share Your friends.